Marketing Communication (Marcomm) is a new course in the world of lectures, which is a combination of two fields of marketing and communication. In this department students and students learn how to be a good communicator, learn marketing strategies, and manage the company’s systems and marketing so that the image of the company that formed to be stable and even increased. In This article I will discuss some things that matter related to the world of Marketing Communication, coincidentally this resource person is a college student Marcomm who is also now a practitioner. Here are some things that will be discussed. Dhea Permata Karina (25), or commonly called Dhea is a college student of Marcomm graduated from Bina Nusantara University (BINUS), at that time special interest in Marcomm Department only Public Relation (PR) and Broadcasting, and he majored in PR. In BINUS lecture procedure, that is one of the requirements for graduation is that every student is provided for 1 semester is required to follow internship in a company or make their own business. Dhea chose to participate in the internship, during which he had the opportunity to attend internship at the Pacific Place Mall Management Office and deployed in the tenant department, whose job description was to intermediate communications and information from each tenant to management, such as the needs or complaints of each tenant. Dhea successfully completed his lecture in 2013. And started his career in 2014 in one media company, Kompas Gramedia, and she has given the opportunity to work in Marcomm Division, but only lasted 1 year because she didn’t feel match between job desk with her passion. 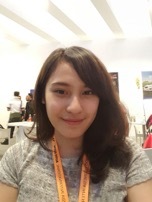 Dhea wants to find another experience by choosing to move to an automotive company that is Nissan Motor Indonesia, and she got the Marcomm Division in Datsun and luckily she can survive until now. According to Dhea after several years of work as Marcomm, the most frequently applied subject in her work is Integrated Marketing Communication (IMC) course, and as the principle of Marketing Communication, which she studied about AIDA (Awareness, Interest, Desire, Action) as a set of marketing strategies, Awareness: as Marcomm must figure out how to raise awareness of the customer towards the existence of the product or goods of a company ad in billboard, TV, and other media. Then, interest; how to package the ad to be as attractive as possible. When talking about obstacles, looking at the current business situation, the movement can be said to be fast and fluctuating, where competition and competition are quite difficult, so according to Dhea, the difficulty she felt was that the Marcomms were challenged to profit more creatively and generate more interesting ideas than the existing competitors, but still must be in accordance with the character of the brand and does not eliminate the identity of the company. Dhea also revealed that the material being studied and the existing system while being studied was good enough, in which he felt that many tasks were aimed at sharpening to generate ideas, and from that task, the students were trained to present the results of their work. it’s all that is often applied and he feels when it’s working. In learning, students are also directed to look at problems based on case studies and afterward trained to find ways to solve the problem, according to Dhea it is all a means to train and develop the potential of the students before entering the world of work.